If you have sales reps in the field that are covering large territories, chances are you need a way to make each sales trip as effective as possible. MarketMAPS shows you ways to maximize efficiency within your large sales territories. Laptops and smartphones have made it easier for sales representatives to have those important meetings and close sales without having to leave the office. Video conference programs like Skype and GoToMeeting allow you to have face-time with your clients without paying travel costs. Sales is a relationship business, so it’s imperative to connect outside email and phone calls to maintain relationships in a large territory. In many large sales territories, traveling is unavoidable. Use your downtime in airports and on planes to finalize small parts of a sales presentation or double check numbers. Invest in a long-life battery for your laptop; you may need to work on the plane, then drive straight to a sales presentation without the ability to charge the battery. Technology is great, but sometimes a face-to-face meeting is the only way to get things done. When you must travel, work in extra time to allow for flight delays. Research nearby companies before your trip so you can visit them while you’re in the area. Successful sales reps cover large areas by making the most of every spare moment when they travel. Managing sales reps within a large territory can be difficult, but with the right tools you can create an organized sales territory strategy. Contact MarketMAPS if you need a way to better visualize your sales territories. We provide high quality sales territory maps of anywhere in the US and the world. We use your custom boundaries to create sales territory wall maps, map books, and digital maps. You can add demographics, locations, sales data, and other information to your sales territory map to make it exactly what you need. Contact MarketMAPS today. 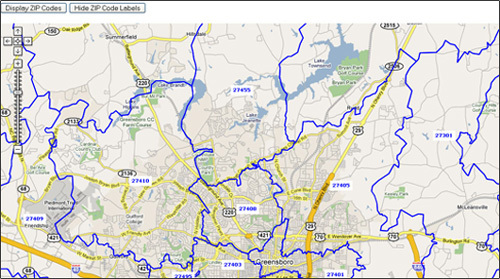 Make our high quality sales territory maps part of your sales territory strategy.